One has to admit, having one of Warrel Dane’s final recordings has to be one hell of a selling point. The young act Collector has that in their back pocket, in addition to some performances from both Vicky Psarakis (The Agonist), and Chris Broderick (Act of Defiance, ex-Megadeth). Not too shabby for a debut. Outside of guest appearances, there’s a lot to like about Collector, but some of it does feel like it needs some time to mature. Hitting the good stuff first, Collector are successful in launching a sound that cherry-picks from a variety of metal styles and structures, and finds a way to make it work for them. Blurring the lines between melodic death, thrash, and traditional heavy metal, it’s an energetic mix that tends to go for the more aggressive end. Certainly there’s plenty of soaring choruses to be had (“A Tale of Titans”), but they do tend to enjoy a more driving approach. The songs that seem to work best, on the whole, are the two shortest tracks, “The System Has Failed” with it’s thrashy attack, and the darkly heavy “Vantablack.” That leads us to the biggest stumbling block of Liberation’s Fall – song length. Many tracks aspire to be 8-10 minute epics, but if they had a minute or two trimmed from them, they would feel more effective in the longrun. Parts of the melodeath-y “Between the Two Demons” lose their stream as the track continues onward, seemingly for the sake of launching a guitar lead instead of getting back to the action. It’s fantastic to hear Dane’s pipes again on “End This Life,” and Broderick lays down a killer lead, but there seems to be some wasted space here as well that bogs it down. Likewise, some of the death metal vocals are a bit off-putting and sometimes follow a strange phrasing. 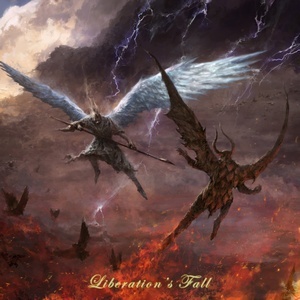 That being said, Collector does hold some promise in their ability to genre-mash and provide bouts of energetic carnage on Liberation’s Fall. It stays catchy while providing plenty of crunch. With some vocal and songwriting reflection, Collector are bound to be elevated even closer to the top next time around.